You can refresh extracts of data hosted with most cloud data providers directly on Tableau Online. You can run a refresh from Tableau Bridge for data sources you’ve set up there. If a data source has scheduled refreshes, running a manual refresh does not affect the schedule. 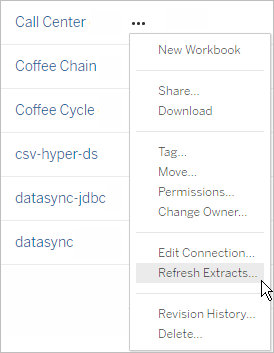 When an extract refresh is performed on extracts created in Tableau 10.4 and earlier (that is, a .tde extract), the extract is upgraded to .hyper extract automatically. While there are many benefits of upgrading to a .hyper extract, you will be unable to open the extract with previous versions of Tableau Desktop. For more information, see What's new to extracts. Sign in to the Tableau Online site to which the data source is published. On the Data Sources page, select the More actions icon (…) next to the data source you want to refresh, and then select Refresh Extracts from the menu. Under Refresh Now, select Full Refresh. Note: For data sources that have scheduled refreshes, site administrators can initiate a refresh also from the Actions menu on the Tasks > Extract Refreshes page. Open Tableau Bridge from the Windows system tray, and select the Run now icon ( ) for the data source. Note: When an extract refresh is performed on extracts created in Tableau 10.4 and earlier (that is, a .tde extract), the extract is upgraded to .hyper extract automatically. While there are many benefits of upgrading to a .hyper extract, you won't be able open the extract with earlier versions of Tableau Desktop. For more information, see Extract Upgrade to .hyper Format.